If you're looking for retro styling along with plentiful cargo room, you need (or want) big horsepower and torque, you want easy entry and exit from a vehicle, you need space for four passengers and you like receiving an overabundance of attention from passers-by, you'll love the Magnum. 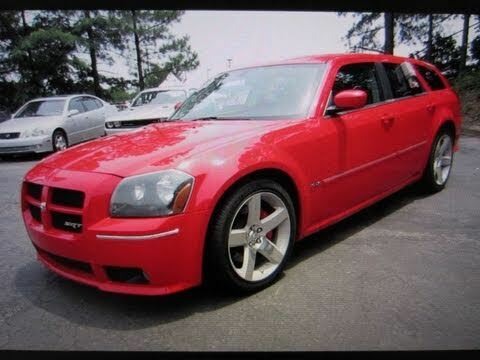 My Dodge magnum a structured very well. My vehicle is a very good car. It is reliable it is better on gas when on the highway going long distances. My car is built and structured very well it is made for our family it is got lots of trunk space. When it needs repairs the parts are not expensive. Which makes for added benefits not worrying if something was to happen we know that the parts are not expensive. It is a very popular car because of the shape and size. It is comfortable and very heavy so if you were to break down and needed to push it the car is not going to move you would need help. Problems are usually with the front end tires are expensive just depending on what size you have I have 22 in tires it tends to be expensive. Performance-wise it is great it takes you from point A to point B it is very durable car it runs very good there's no problems with it if you keep it up regular check-ups oil changes just like we need to be seen the car also needs to be cared for if not it will not last. I love my magnum it is a great looking and performing vehicle. I purchased my 2007 magnum when it was brand new. It has been a great car every since. My car have not had any major work done on it yet. The interior is tough enough to make it through my 10 plus grandchildren with no holes. The performance from it is awesome. It is made like a station wagon and holds a lot of things like groceries, books, etc. The seats are electric when you need to pull the seat up on the driver side. There is a button that automatically pulls the seat back and forth, and up and down. The Dodge that converts to all car/truck/and wagon. No major problems, Dodge is a very dependable car very good on gas and out of town trips. Dodge are very roomy for your whole entire family very good on loading and loading materials and other items the Dodge has a CD player, large truck area that let down like a truck bed very extended area materials large roomy back seats hot heat for the winter and cold ac for the summer you can't go wrong with a Dodge low maintenance when time to buy parts cheap on labor to be fixed v6 engine and 3. 5 motor. Dodge Magnum test drive &amp; Review!